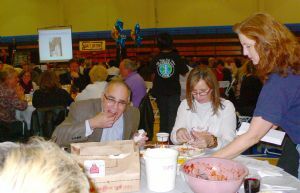 Richard Esposito, Mountain Democrat and Village Life publisher, digs into some delicious crab at the El Dorado Hills Rotary annual Crab Feed while club president Kathy Witherow, right, makes sure everyone has what they need. The El Dorado Hills CSD gym was festive with blue and gold balloons as 400 enthusiastic crab gourmands enjoyed the 17th annual Crab Feed & Dance on Saturday, Feb. 20. This popular event is one of two major fundraisers that pay for all of the Rotary Club of El Dorado Hills' donations and activities. Terri Jessen-Tennant brought it all together and kept the event on track all evening. Patrick Tryhane and his kitchen crew had everything ready to go as guests arrived and kept the Interact wait staff busy serving all the courses. Head bartender Gary Lacey and crew let no one go thirsty. And President-elect Bill Tobin did a masterful job as Master of Ceremonies. Kudos to John Tennant for the slide show. The Oak Ridge High School Interact Club servers earned $800 in tips, which they donate to a local charity. Crab Feed tips are divided equally between the Grace Foundation and Nothing But Nets. Thanks to all our sponsors, supporting businesses and auction donors for this successful event. The proceeds will benefit local and Rotary International charities, including Easter Seals Superior California, the Jeff Mitchell Memorial Little League Field and Polio Plus.